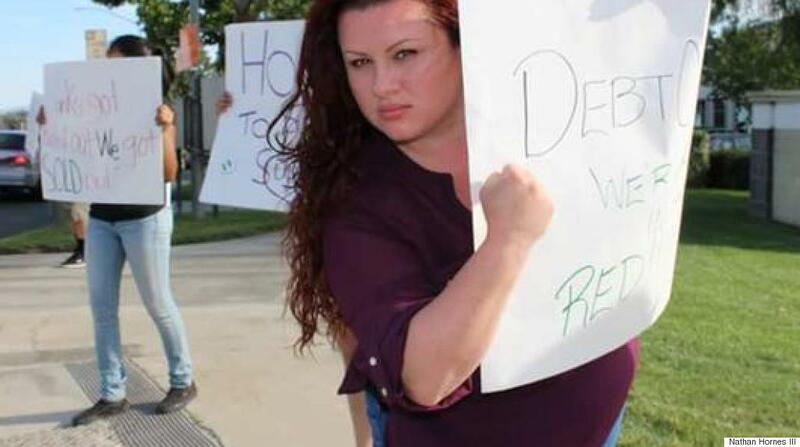 Tasha Courtright, a former Corinthian Colleges student, holds a sign at an April 2015 protest. Dawn Lueck’s bosses were beaming. It was the height of the Great Recession, and hundreds of thousands of Americans were losing their jobs each month. But executives at her company, a network of for-profit universities branded as Heald Colleges, were ebullient. Heald, which was founded in 1863, counts governors, senators and A.P. Giannini, the co-founder of Bank of America, among its alumni. But in 2009, it became part of Corinthian Colleges Inc., a vast conglomerate that, at its height, served over 110,000 students at 120 campuses throughout North America. The fortunes of for-profit colleges tracked the Great Recession in reverse: Corinthian’s stock price more than doubled between March 2008 and February 2009, just as unemployment spiked; enrollment increased more than 50 percent between fall 2008 and fall 2010. Widespread layoffs left people scrambling to acquire additional skills to compete in an impossible job market. And Corinthian recruiters sold prospective students on a dream: graduating college and ascending into the middle class, with career training that would pay off. In lawsuits, official complaints to state and federal regulators, sworn declarations submitted in Corinthian’s bankruptcy proceeding, and conversations with The Huffington Post, dozens of former Corinthian students and several former Corinthian employees said that Corinthian drowned students in debt and sent them off with meaningless diplomas that did not help -- and sometimes even harmed -- their job prospects. It illegally padded job placement statistics and gave students college credit for “externships” at fast-food restaurants. It charged students up to 10 times what a comparable community college degree would cost. More than 1 in 4 Corinthian graduates defaulted on their student loans, according to Education Department data. And for years, the Education Department not only failed to recognize the depths of the abuse, but effectively funded Corinthian’s business model, sending the company billions of dollars in financial aid to help cover students’ bills. Amid the lawsuits and enforcement actions from state and federal regulators, Corinthian filed for bankruptcy in May -- the most spectacular in a series of for-profit college failures. By late April, the company had already sold or closed all its campuses. But students lured in by Corinthian have not received comprehensive loan relief, leaving them as the ultimate victims of the for-profit college bubble. Now, a growing contingent of former students calling themselves the Corinthian 100 have refused to pay their debts, arguing that they were duped by a predatory lending scheme. Despite support for the debt strike from Democratic lawmakers and advocates, the Education Department has resisted demands for blanket loan relief. In 2008, Tasha Courtright visited the Everest College campus in Ontario, California, with a friend. She was not looking to pursue higher education. “The recruiter said, 'How about you? Do you want to go to school? '” Courtright recalled. The recruiter called Courtright repeatedly for two days, pressuring her to make a decision. “They said classes were starting and ‘If you don’t do it now, you never will.’ So I went down again and signed up.” Courtright spent four years at Everest, earning a bachelor’s degree in applied business management. She said recruiters promised she wouldn’t pay a dime; she ended up with $41,000 in student debt. High-pressure sales tactics like that were deliberately targeted at vulnerable demographic groups, including single mothers and the unemployed, according to Lueck, the former Corinthian manager. Recruits were often the first in their families to attend college. Almost anyone could qualify. Laurie McDonnell, a librarian at the Everest-Ontario Metro campus, resigned after learning that her school had enrolled a man who read at a third-grade level. The goal was simple: profits. Smaller chains like Lincoln Tech or DeVry used to dominate the for-profit college industry. But toward the end of the last decade, larger, publicly traded companies took over. By 2009, three-quarters of all U.S. students enrolled in for-profit colleges were at schools owned by a corporate conglomerate or private equity firm. Goldman Sachs owns around 40 percent of Education Management Corporation, another operator of for-profit colleges. Many for-profit college companies own multiple university brands. Corinthian, which traded on Nasdaq, ran Everest, Wyotech and Heald Colleges. The consolidation of the industry changed how for-profit schools operated, argues Elizabeth Baylor, senior investigator on a landmark 2012 Senate Health, Education, Labor and Pensions Committee study of for-profits. “Student success was not the primary focus of the entity. It was returning investor value,” Baylor, who now works at the Center for American Progress, told HuffPost. One-quarter of the average for-profit college budget goes to marketing and recruitment, Baylor said. The goal is to capture and retain students, and squeeze as much money out of them as possible. The 2012 Senate report found that Corinthian’s students defaulted on their loans at a rate that was “by far the highest of any publicly traded company” that investigators scrutinized. Lueck explained that Heald would forecast higher annual enrollment targets for every campus across its network, putting pressure on recruiters to deliver. “You get students in, establish trust and a connection, and find out what their hot buttons are,” she said. Corinthian General Counsel Stan Mortensen responded by saying that 10,000 people worked for the company at its peak. “With that number of people, I’m sure you can find someone who will say almost anything,” he told HuffPost. He pointed to the 10,000 signatures on a Change.org petition supporting Heald Colleges and a handful of positive testimonials from Corinthian students and employees, who were “proud of the institutions they attended and worked for.” The petition was initiated by Eeva Deshon, the president and CEO of Heald. In their sworn declarations submitted in Corinthian’s bankruptcy proceeding, students corroborated Lueck’s claims. They said Corinthian recruiters cited specific numbers of graduates who obtained jobs in their fields, typically over 80 percent. The recruiters identified starting salaries well above entry level and promised help with lifelong counseling and accreditation for specialized work. Campuses were adorned with photographs of smiling graduates at their new careers. The financial aid process, in contrast to the pitch, was typically quick and vague, without even a clear explanation of how much classes cost. “They had the papers literally ready,” said Nathan Hornes, a high school dropout who moved to California from Columbia, Missouri, seeking a career in music. “They are so good at saying, 'Here’s what you need to punch in on the computer, let’s create a PIN, let’s do this. '” Hornes worked toward a GED and took business classes concurrently at Everest-Ontario Metro, eventually running up over $60,000 in debt, he told HuffPost and wrote in a sworn declaration. According to Lueck, students signed an open-ended “master promissory note,” allowing the school to recertify new loan amounts every year. This would happen annually through a chaotic process known as repackaging, in which students would turn in financial information and the staff would shuttle them into new loans and grants. Corinthian students attracted huge amounts of financial aid money from the federal government: Close to 90 percent of the company's revenue, around $1.4 billion per year, came from taxpayers. Lueck, the former corporate finance manager, said the loan process moved so rapidly that students may not have understood they were giving college staff permission to sign them up for numerous loans. Sarah Dieffenbacher, a criminal justice major, rang up over $110,000 in loans without ever earning a bachelor’s degree, she wrote in a sworn declaration. Officials would pull Dieffenbacher out of class during finals week to set her up for the next school year. “They told me to log into the computer loan account, and said words to the effect, ‘Just put in your password and we’ll handle the rest,’” she wrote. Although most loans were federally issued, Corinthian also pushed some students into expensive private loans. The private loan program, known as Genesis, was designed for people with bad credit, according to Lueck. In a September 2014 lawsuit, the Consumer Financial Protection Bureau alleged that Genesis loans carried interest rates double those of federal student loans and had to be partially paid back while students were still in school. Staffers would pull students out of class, and even withhold diplomas, to induce students to pay back Genesis loans, the CFPB claimed. Still, 60 percent of those with Genesis loans defaulted within three years. “I never remember seeing a screen that clearly summarized the details of the loan,” Lueck said. As interest and late fees accrued, she said, students had trouble accessing information on their full loan balances. Tasha Courtright claimed in both an interview and her sworn declaration that she was promised that Cal Grants, a California education aid program, would cover her tuition. “They said there was no way I would be denied,” Courtright said. “They neglected to tell me I didn’t qualify for Cal Grant until I took 36 credits because I was out of high school too long.” Even then, Corinthian officials promised Courtright that the grants would be retroactively applied. “Then I got a Cal Grant letter. It said I can only use the grant for future classes.” Everest would also hoard Courtright’s grant money, delaying disbursements for her living expenses for up to a year. In interviews and legal filings, Corinthian students said they paid top dollar for what they characterized as a substandard classroom experience. Lueck said that Heald Colleges fired full-time teaching staff and used adjunct professors to teach classes in order to save money. At least one of Dieffenbacher's legal instructors had been disbarred, the criminal justice major claimed in a sworn declaration. One student said that final exams were “open-book.” Another, Nadia Akins, saw that a fellow student had the answers taped to the bottom of her shoe. “I reported this to the teacher, and the teacher kicked me out of the classroom,” Akins said in her legal declaration. Hornes described a classroom environment akin to summer camp. Nathan Hornes' school told him that his carhop job at fast-food chain Sonic qualified for course credit. “My externship was a job I had for two years,” Hornes said. His school told him that the carhop job at fast-food chain Sonic qualified for course credit. “They started calling my manager, asking about getting people hired at Sonic. It’s a joke,” he added. Aeyla Admire, a student at Everest College in Reseda, California, did an externship at an OB-GYN office. “I experienced unwelcome physical and sexual advances by the doctor,” Admire wrote in a sworn declaration submitted in the Corinthian bankruptcy proceeding. “When I complained to the case manager for my externship, she told me that I should not change my placement. ... She said that if I were to pursue the issue, it would look bad for me, and it would be very hard to find another job. She told me words to the effect that ‘all doctors are like that,’ and that they have the ‘education to do whatever they want.’” Aeyla eventually quit. As Corinthian's enrollment expanded in the Great Recession, career services counselors were not equipped to handle the crush of graduates, and jobs were difficult to secure in a sluggish labor market. Appointments with career services would have to be made weeks in advance. Counselors forwarded students Craigslist ads. Some Corinthian graduates learned that having the school on their resume was more of a hindrance than a help. Obsolete coursework bore little relation to the skills needed for employment. Several students described nightmare job interviews during which they realized they weren't prepared for the intended positions. One paralegal student, Isabel Carranza, panicked when she “realized that I did not learn anything that paralegals need to know,” according to a sworn statement in the bankruptcy case. While Corinthian colleges were accredited and eligible for federal financial aid, Carranza wrote that she belatedly learned her paralegal program was not on the American Bar Association's approved list, despite promises from Corinthian recruiters and promotional materials. At best, potential employers had never heard of the colleges; at worst, they refused to accept them as legitimate. Once law enforcement began circling around Corinthian, the negative publicity became detrimental in the job market. Hornes had an employer at a bank laugh in his face when he said he went to Everest, telling him he would never hire anyone from that school. “I’ve been told by three attorneys, 'If you came to me looking for a job with that degree, you can forget it,'” said Hutchison, the paralegal student who has $33,000 in outstanding loans. She said she only obtained her job as a legal secretary after taking Everest off her resume. An Everest College campus in Alhambra, California, seen through the outer gates on April 27, 2015. As the Education Department was pushing Corinthian to verify its job placement statistics, the company’s career counselors grew desperate. According to documents obtained by The Huffington Post in 2013 and cited by California Attorney General Kamala Harris and the CFPB in lawsuits, Corinthian paid temp agencies and employers to place graduates for short periods to pad their job numbers. Corinthian told HuffPost in 2013 that it rejected this allegation. The company’s then-spokesman, Kent Jenkins, pointed reporters to data showing that 69 percent of Everest students gained jobs in their field within 18 months of graduation and argued that paying companies to hire graduates was a “one-time-only initiative” at an Everest College campus in Decatur, Georgia. But Nathan Hornes and Dawn Lueck told HuffPost the practice was more widespread. The company’s executives did well, too. Massimino, the Corinthian CEO, earned $3 million in 2010, and four other executives made over $1 million that year. Between June 2013 and September 2014, the most recent period for which data are available, Corinthian insiders, including Massimino, sold 1.2 million shares of Corinthian stock worth over $400,000, according to the company’s filings with the Securities and Exchange Commission. After selling off 56 campuses last fall to ECMC, a debt collector with no history of educating students, Corinthian shut down its remaining 30 schools on April 27 and filed for bankruptcy. “Corinthian did everything possible to try to sell our schools to responsible owners so that students would be able to continue their education,” said Mortensen, the general counsel. Frances Hutchison had just graduated when she heard the news. “Who will hire someone from a school with a soiled reputation?” she asked. Other students were weeks away from degrees when their schools closed and may find it difficult to transfer Corinthian credits to legitimate colleges. Isabel Carranza hadn’t even opened the $380 worth of books she had bought for the upcoming school year. But she couldn’t return them. Students have begun to fight back. Public Counsel, a pro bono law firm in Los Angeles, is one of three firms representing some 500,000 former Corinthian students with potential aggregate claims of $25 billion in Corinthian’s bankruptcy proceeding. “This is among the most egregious fraud that I in 25 years of practice have ever seen,” said Anne Richardson, associate director of the Opportunity Under Law section at Public Counsel. Nathan Hornes, who now works at a Smashburger and said his commute is so long and costly that some days he can’t afford food, started calling friends from school even before the bankruptcy. “I started organizing. I had 130 students in three weeks. We had meetings in a coffee shop across the street,” he said. Hornes and Tasha Courtright started a Facebook group called the Everest Avengers and were among the first students to decide to go on a debt strike, refusing to pay back their loans. The Debt Collective, an organization that grew out of the Occupy Wall Street movement, contacted Hornes and Courtright, and created what is now the Corinthian 100. “More students are joining every day,” Hornes said. Nathan Hornes now works at a Smashburger and said his commute is so costly that some days he can’t afford food. The Education Department and CFPB negotiated $480 million in debt relief on private Genesis loans, but most of those loans are in default and have been deemed uncollectible. Granting relief to all Corinthian students would cost billions, which has made the government leery. Education Department officials have even pressured students at Corinthian campuses that were closed to transfer to other for-profit colleges. But “students deserve those protections” from fraud, said Baylor of the Center for American Progress. “You can’t turn around and say that this outstanding student loan debt is too much to write off.” Heald laid off Dawn Lueck in 2012. She now volunteers with the Debt Collective, helping former Corinthian students understand their loan situations. Like many for-profit college employees, Lueck had also been a customer. She holds degrees from the University of Phoenix and ITT Tech, where she started working at the front desk when she was 18.